One of the true rewards of this job is being able to share with all of you amazing books that, for one reason or another, simply do not get the exposure and acolytes they deserve. This is such a case. It overflows with so much old fashion adventure, I’m hard pressed to describe the fun I had reading it. Be aware, it is not a graphic novel, despite both its gorgeous cover, by artist Loston Wallace, and its comic dimensions. It is a prose novel, but packaged differently with a nice overall design. It’s both very easy to handle and read. For those of you not versed in classic English literature, Becky Sharp is the heroine of William Makepeace Thackeray’s 1947 novel, VANTIY FAIR; a book that satirized the mores of 19th century English society. Harris actually teaches English Lit, thus his familiarity and obvious fascination for the character. But it is what he does with her in this madcap tale that is pure pulp genius. Since the lovely lass came to a rather tragic ending in the Thackeray version, Harris’s offers us a duplicate Becky Sharpe from an alternate world. In this reality, Becky is recruited by a sect of Lovecraftian aliens posing as human to help them defeat a rival monster known as Tulu. But to do so, Becky will first have to be granted immortality and then sent on a globe-spanning quest to obtain the required talismans needed to defeat Tulu. Once her journey begins, through both geography and time, Becky manages to meet Asheya, known as She-Who-Must-Be-Obeyed, encounters the giant gorilla Kong of Skull Island, enters into a passionate romance with the Scarecrow of Romney Marsh, travels with Nemo and battles a super strong Egyptian Mummy alongside the Ape Man of the African Jungle. And these are only a few of her amazing exploits. The delight of this book is not only its marvelous conceit, but Harris’ talent as a gifted writer. His use of language is deft and exact, with a very beautiful command of style. The narrative has such grace as to carry to reader along effortlessly, all the while painting unbelievable scenes of action and daring-do with panache. This is easily one of the best books I’ve read all year. Last word, if you enjoy reading fresh and original fiction, then consider picking up THE ELDRICTH NEW ADVENTURES OF BECKY SHARP as a Christmas gift to yourself. You can order it at Amazon or go directly to the publisher on-line at (www.booksofmicah.com). Tell them I sent you. This horror book defines the term, page-turner. Sherri and Neala are traveling through woods to do a little hiking. The Dills family (Lander and Ruth, daughter Cordelia and boyfriend Ben) stop at small motel in a sleepy little off-road to rest. Within hours the six of them are kidnapped by the town’s people and taken into the deeps to be offered up to a wild savage clan of cannibals. From page one, I found myself gripped with an obsessive need to know what happened next. So masterfully is this suspense story told, it is virtually impossible to set down. During his short lifetime, Richard Laymon wrote of the most gripping horror stories of our times and quickly amassed a devoted following of fans that included Stephen King and Dean R. Koontz. Sadly his work wasn’t discovered by American readers until after his death in 2001 when he won the Bram Stoker Award posthumously for his novel, The Traveling Vampire Show. 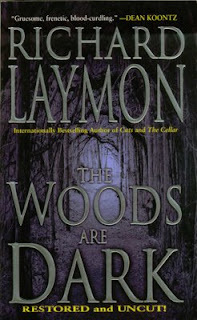 Laymon’s genius was depicting normal people, placing them in settings of pure terror and then allowing them to react truthfully. Unlike the characters who inhabit today’s gore splatter movies, who, when encountering cannibals in “the hills”, immediately start acting like idiots. Not so the characters in Laymon’s book. They fight back, for all they are worth, their primal survival instincts quickly overriding their civilized sensibilities. One of them to point of becoming even more demented than the savages themselves. It is a powerful and all too believable metamorphosis. If you are in the mood for a good scare unlike anything you’ve ever experienced, then this is the writer for you, and THE WOODS ARE DARK is by far his horror masterpiece. But a final word of caution. Read it with the lights on. It will give you nightmares. A few years ago an internet outfit called Frontier Publishing came on the pulp scene with several titles geared solely to old fashion action and adventure. Sadly they could not make a go of it and folded, but not before three of their best writers got together and founded Pulpwork Press. One of these was Joel Jenkins and this book was a product of that new venture. In the metropolis of Denbrook, Damon St. Cloud is an investigative reporter looking into City Hall corruption that leads all the way to the mayor and his cronies. St. Cloud’s prying eventually threatens the wrong people and he returns home one night to find his wife and son butchered, their bodies torn to pieces, the house painted in their blood. St. Cloud, mentally unhinged by the experience, disappears and the prevailing rumors are he either died or ended up in a sanitarium. Both suppositions are miles away from the truth. After distancing himself from the horror foisted on him, St. Cloud comes to the startling conclusion that his family was murdered by vampires secretly in the employ of the city fathers. Knowing he is ill prepared to deal with them, he goes into self-exile, traveling the world’s exotic locales to amass the arcane knowledge he will need to fight these blood-sucking demons. DEVIL TAKE THE HINDMOST begins many years later with Damon St. Cloud’s returns to Denbrook and the hell he brings with him. Armed with both knowledge and state of the art weaponry, he soon begins dealing cold, ruthless vengeance on the vampire clans of Denbrook single-handedly. He is a tireless, fearless angel of retribution and soon those responsible for the deaths of his family are not so self-assured of their invulnerability. This is pure purple-prose at its frenetic best. Jenkins creates marvelous characters, good and bad, who populate his story and move it along with a razor sharp pacing that never lessens. His action sequences are among the best I’ve ever read. 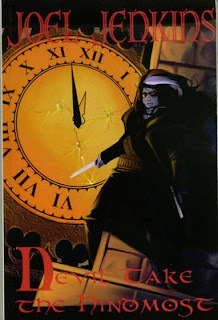 Currently books starring vampire hunters are very much in vogue, but very few of them pack the wallop this book contains. You can find it here (http://www.pulpworkpress.com/apps/webstore/) Tell Pulp Fiction Reviews sent you. John Farris is a smooth story teller who writes with both economy and style. His protagonist is Peter Mallory, an ex-mob gunman who had thought his past was behind him. Now living in the Miami area, he owns a bait shop and is engaged to a lovely young socialite. Life is good; until the day that past comes knocking. Mallory’s old mentor and employer, Boss Macy Barr, is being threatened by an unknown assassin from yesterday. Years earlier, running a protection racket, Barr had ordered a family run business burned to the ground when the owner refused to capitulate to his extortion demands. Somehow the man’s daughter survived and now, years later, has set about claiming her revenge her family by killing everyone involved with the fire. Barr has turned into a feeble old man scared for his life. Mallory is the only person he trust to hunt down the mysterious killer and save him. Amidst Barr’s crumbling empire, Mallory must diplomatically search out a killer while at the same time avoid crossing paths with the other mob figures intent on inheriting Barr’s territory. Farris is excellent at propelling the story and offering up a few red-herrings along the way. There’s plenty of action and a powerful climatic finish that had me turning pages quickly. This one has it all; sympathetic characters, tough as nails gangsters and several hot women who are twice as lethal as the men. BABY DOLL is a classic gangster novel by one of the best in the business. Don’t miss it.